At this morning’s Conversational Marketing Summit in New York, SocialMedia.com CEO Seth Goldstein revealed that the advertising company had been working with MySpace to develop and deploy ‘Interaction Ads’ – an advertising product that can prompt a MySpace member for input and use that, along with MySpace’s social graph, to tailor the advertising shown to their friends. The ads are a variation on SocialMedia.com’s powerful Friend to Friend social ads, which the company first rolled out in March. The idea behind them is simple: if I visited a page on MySpace Music, an ad could ask me if I preferred Rock or Rap, with a pair of checkboxes where I could indicate my favorite genre. 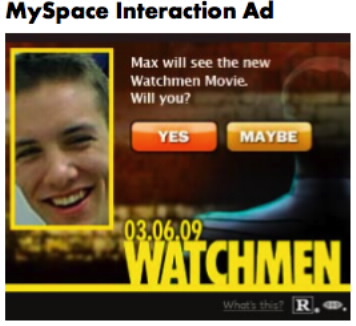 Then when my friends visited MySpace, they could see an ad that said “Jason likes Rock and Roll! Which do you like?” This level of customization may seem a little strange at first to users, but the ads tend to be far more engaging than typical banner ads. I won’t be surprised if ads that pair user interaction and the social graph become the norm over the next few years. This news is obviously a very major win for SocialMedia.com – not only is the company running campaigns from major brands, but MySpace itself is working in tandem with the company to sell the ads. It’s also good to see MySpace working with third parties to maximize revenue opportunities, especially as its user growth begins to stall.